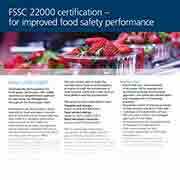 Developed by the Foundation for Food Safety Certification, FSSC 22000 represents a whole new approach to food safety risk management throughout the food supply chain. FSSC 22000 is a complete certification scheme based on ISO 22000, the global food safety management system standard, combined with one of the sector specific technical specifications for PRPs (e.g. PAS 220/ISO 22002-1 or PAS 223) and additional Global Food Safety Initiative (GFSI) requirements. FSSC 22000 has been given full recognition by the GFSI. Who can use FSSC 22000? FSSC 22000 has been designed for implementation by all food products, food ingredients and packaging material manufacturers, irrespective of size, sector or geographical location. Why is FSSC 22000 important to your organisation? High quality food safety audit s delivered through the technical expertise and in-depth food sector knowledge of LRQA assessors. Holistic view with systematic identification and better management of interacting processes. Continual improvement of your system and processes. Ease of migration from industry wide food safety standards and schemes. Good communication, we know it's key in delivering transparency through every step of the FSSC 22000 certification process. We work with our clients and governing organisations and set clear expectations to all parties on deliverables. A streamlined auditing approach ensures your certification is cost-effective with minimal disruption and completed within critical timelines. We are now fully accredited to deliver FSSC 22000 certification.